Healthy Thai Food: 21 Delicious Dishes that are Actually Good For You! Is Thai food in Thailand healthy? That’s quite a complicated question, mainly because there are so many different Thai dishes available in Thailand, ranging from processed, greasy, and sweet, all the way to fresh, spice filled, and vegetables galore. As a long term Thai food eater, and overall Thai food addict, I’ve been able to explore and taste quite a few Thai dishes. In this article I’ll be highlighting some of what I think are the most healthy Thai foods for you to eat when you’re in Thailand (or even if you make Thai food at home or eat Thai food at a restaurant no matter where you may be). 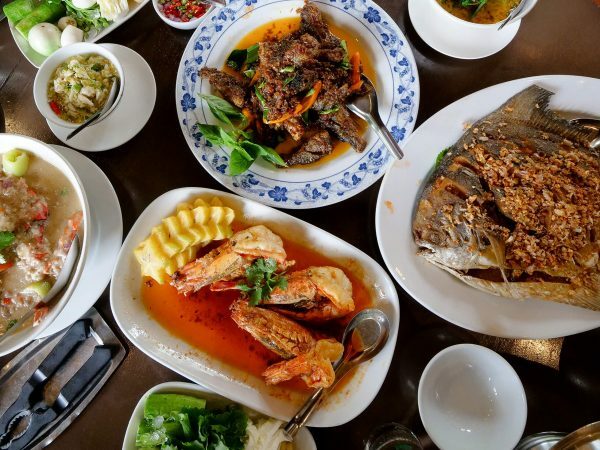 Traditional Thai food is known to be quite healthy, making use of natural and fresh ingredients, paired with lots of spices, herbs, and vegetables. But the problem is, some Thai dishes taste amazing, but then surprise you with how much sugar, oil, or MSG is used. Knowing what to order, and how to order it, can give you the upper hand when it comes to eating healthy Thai food. In this article, I’ll share a few of the best dishes you can eat that I think are pretty healthy. Disclaimer: Quickly, before I get started, I just wanted to tell you that I’m not a nutritionist or a doctor, so don’t take anything in this article seriously if you have real health concerns (consult a real doctor). 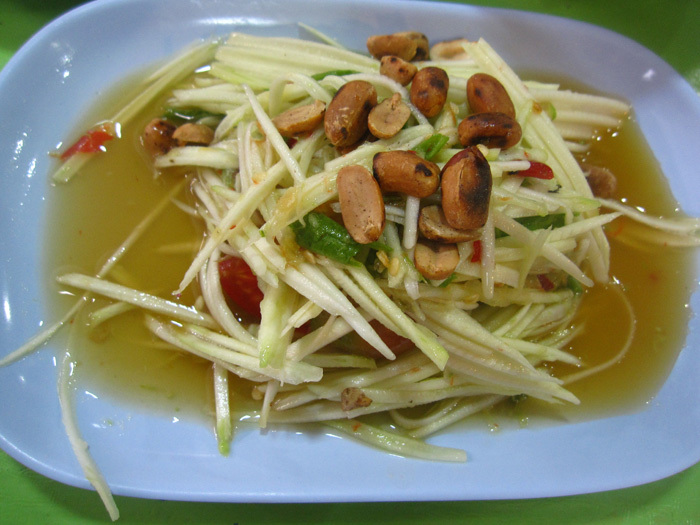 Famous and widely available throughout the country, is Thailand’s green papaya salad, known much better as som tam (ส้มตำ). The fresh ingredients that go intosom tam (ส้มตำ) often include: shredded green papaya, tomatoes, string beans, dried shrimp, garlic, and chillies, peanuts, and sometimes (depending on where you go and what’s available and what version you order) fresh raw Thai eggplant and carrots. Som tam thai – This version of Thai green papaya salad is the least fishy flavored, and is pretty much slivers of green papaya dressed in a sweet and sour lime juice dressing. The full recipe is quite healthy, but sometimes, because it includes palm sugar, it can be a little too sweet. So normally if I order som tam thai, I’ll ask for, “mai wan,” which means not sweet. Som tam boo pla ra – This is probably the most beloved by locals Thais, especially those who are from Isan (northeastern) province of Thailand. 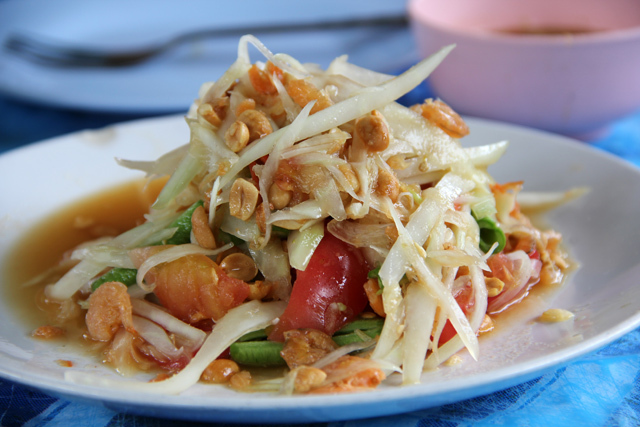 Along with green papaya, the salad also includes fermented fish sauce and crab. Som tam Laos – Probably my favorite version of som tam, is the Loas version, which is also widely available at any Isan restaurant in Thailand. Som tam Laos uses the fermented shrimp paste, but not the crab. What I really like about it is its bold and spicy flavor, without being sweet (and usually no sugar is added). Eaten along with sticky rice, and an assortment of other Thai Isan dishes, green papaya salad is a fresh and vegetable packed Thai dish. Yam mamuang (ยำมะม่วง) is quite similar to som tam thai, except instead of green papaya, the main ingredient is shredded sour green mango – so it’s the Thai version of sour green mango salad. What I really love about yam mamuang (ยำมะม่วง) is the tartness of the mango, which is contrasted by the saltiness of the fish sauce and a touch of sweetness from palm sugar. Again, when you’re in Thailand at a restaurant, you could order “mai wan,” not sweet, or “sai nam tan nidnoy” with just a little bit of sugar. If you love sour and flavorful, yam mamuang (ยำมะม่วง) is a great healthy Thai dish for you to taste when you’re in Thailand. There’s a term in Thai called “ahan dtam song,” which means along the lines of “made to order,” and it usually refers to fresh stir fried Thai dishes – because you put in your order before it’s cooked. Many Thai food restaurants like this are able to stir fry almost any combination of ingredients that you would like to eat, ranging from a single stir fried vegetable (with or without meat), to a mix of whatever vegetables are on hand. Pad pak ruam mit is just a stir fried combination of whatever vegetables are on hand at the moment. When you order, to make it a bit more healthy, you might want to ask for it with nam man nidnoy, just a little oil. 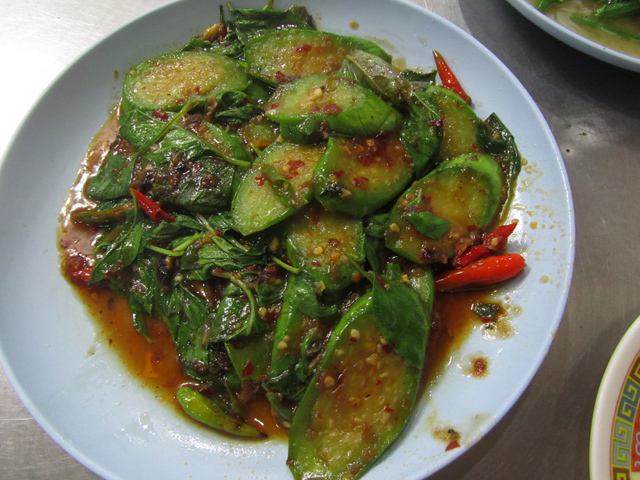 One of the most popular vegetable dishes in Bangkok is pad pak bung fai daeng, stir fried morning glory infused with tasty red chillies and lots of garlic. 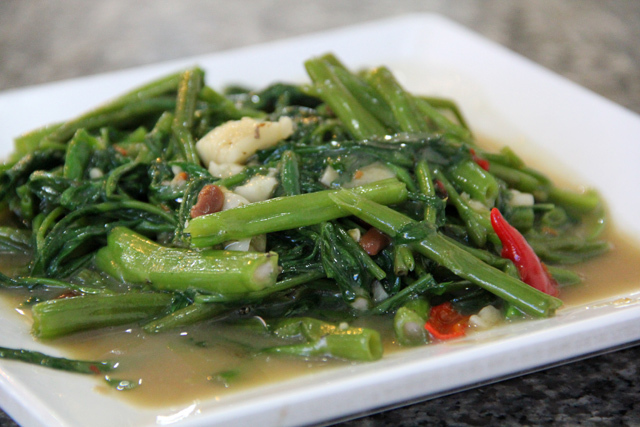 Pad bung is the Thai word for morning glory, also commonly known as ong choy or water spinach. It’s a vegetable that nearly all Thais love, and therefore it’s available at nearly all Thai restaurants and street food stalls that sell stir fried dishes. It’s a standard Thai dish, and overall, I think it’s pretty healthy. This green stalk oriented vegetable is stir fried on an extremely high heat, so it’s usually served flaming hot, and scorched just so the vegetable is wilted, but remains nice and crisp. The seasoning often includes oyster sauce and often a bit of fermented soy bean sauce. 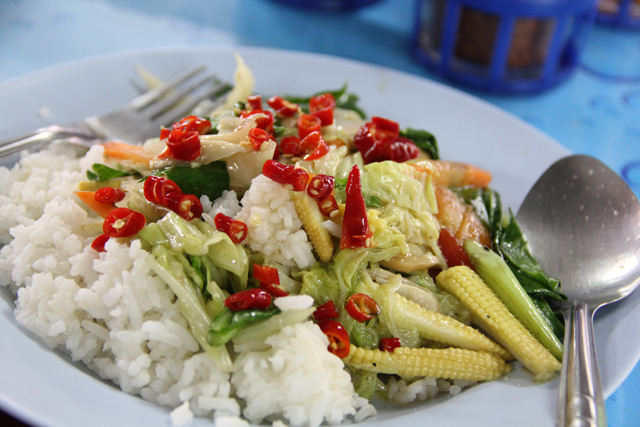 Pad pak bung fai daeng (meaning with chilies) is a wonderful and quite healthy food to eat in Thailand. One of my personal favorite vegetarian Thai dishes is pad pak gachet, or stir fried water mimosa. The tough textured vegetable is packed with earthy flavor and usually it is stir fried up with a generous amount of garlic, chillies and flavorful sauce. The really tough chewy texture may be different from most vegetables, but that’s what I really love about it! Nam Prik is the general name for a variety of different Thai chili dipping sauces that are normally served along with a garden of freshly boiled and steamed vegetables (and sometimes fried fish). In my opinion, nam prik makes a wonderful Thai meal, and I think it doesn’t always get the attention that it deserves on menus outside of Thailand. There are many different types of nam prik, some that are more meat based like nam prik ong (it almost tastes like spagetti sauce to me) to versions that are more vegetable based like nam prik noom (kind of like a roasted green chili salsa). 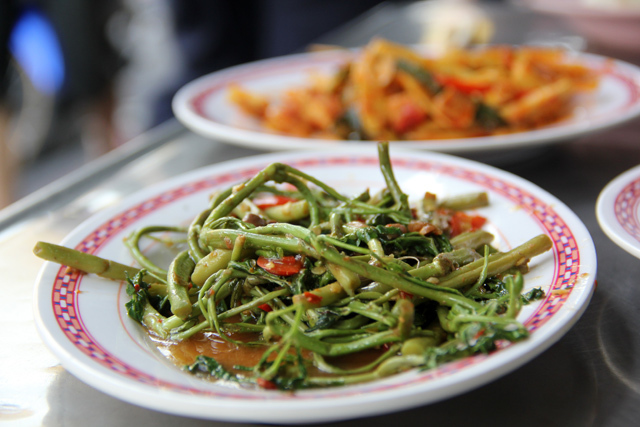 As far as healthy Thai food goes, eating nam prik, along with a wide selection of steamed vegetables that can include eggplant, string beans, cucumbers, bitter melon, okra, cabbage, winged bean, can be pretty healthy. Normally in local Thailand, nam prik is found at markets stalls where you get nam prik in a bag and choose your own vegetables to takeaway. At restaurants, nam prik is often ordered as an appetizer type of dish, a bowl of the chili sauce surrounded by an assortment of vegetables. Jim jum is the Thai street version of a personal hot pot – a selection of ingredients self cooked by each customer on their own table. An aromatic blend of herbs boiled together forms the soup foundation of jim jum and then it’s up to you to add as many vegetables and pieces of pork as you want. You can easily order a pot of jim jum without getting any pork and just enjoying the basket of vegetables and the mungbean clear noodles. Within the realm of Thai cuisine in an incredible range of different fish and methods of cooking fish. 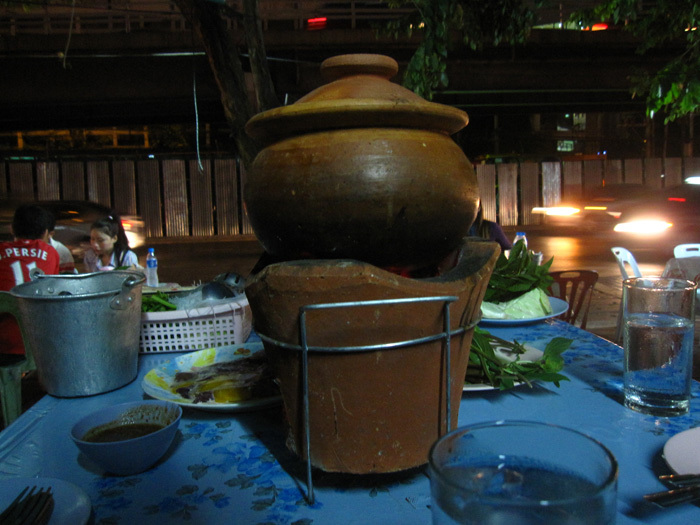 Pla chon, or snakehead fish is one of the most popular kinds of fish eaten on the streets of Bangkok. 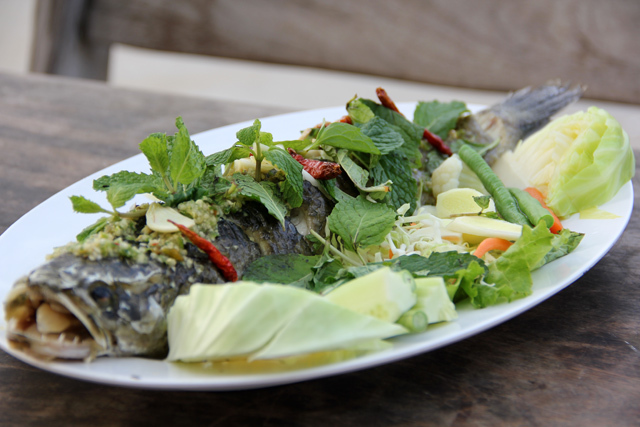 With pla chon lui suan, the fish is steamed, covered in garlic, chillies and mint leaves and then placed on a plate of steamed garden vegetables making it quite a healthy Thai food. It’s also normally served with an incredible sauce that ignites glorious flavor! 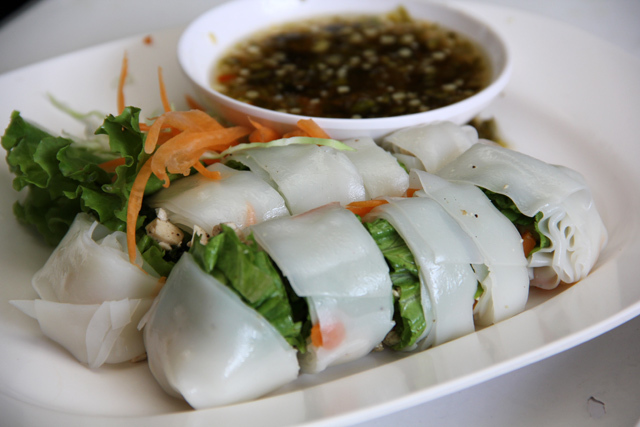 This sort of the Thai version of fresh spring rolls (non-deep fried) which are a handful of fresh raw vegetables encased in a little bit of a rice noodle wrapper to give it some substance. 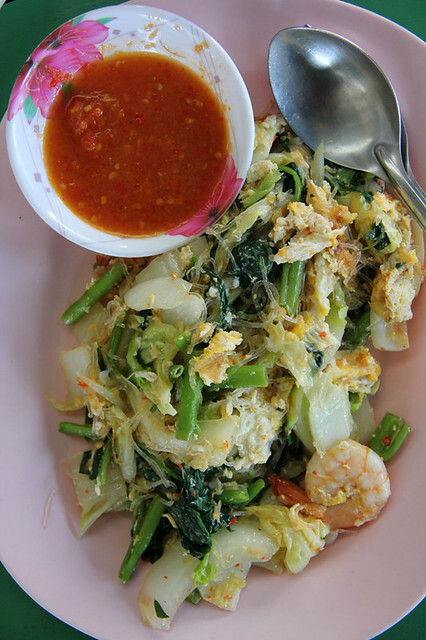 Places that usually sell kuay teow lui suan (ก๋วยเตี๋ยวลุยสวน) usually have a few different choices of fillings, including mackerel fish, tofu (for a fully vegetarian version), and sometimes pork. I usually like either the mackerel or the tofu filling. Along with the tofu or fish, inside of a Thai noodle roll like kuay teow lui suan (ก๋วยเตี๋ยวลุยสวน), there will also usually be leaves of lettuce, carrots, and lots of Thai sweet basil. Finally, this pretty healthy Thai dish is served with a chili dipping sauce that’s sour with lime juice to pucker things up. It’s not really a full meal for me, but it sure makes a nice healthy and delicious Thai snack. The sheer components that make up a bowl of gaeng liang must make it one of the healthiest Thai foods available. The vegetable herbal soup consists of a collection of earthy tasting things like, pumpkin, corn, squash, ivy gourd, mushrooms, and a bunch of other herbs and random veggies. This herbaceous blend is like scooping healthy detoxification medicine into your body – and it tastes great too! For a simply made, but quite delicious and a healthy Thai food, try a bowl of gaeng jued pak ruam tao hoo (แกงจืดผักรวมเต้าหู้). 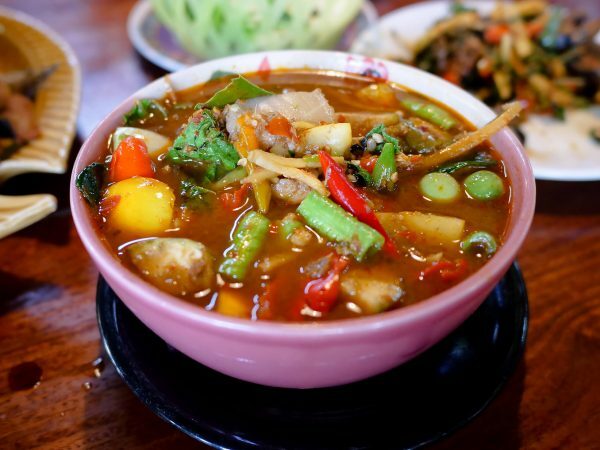 The name of this dish in Thai basically means “plain soup/stew,” so it’s not the most vibrantly flavorful Thai dish, but it’s still pretty good, and includes a nice colorful medley of vegetables boiled with tofu in a minced pork broth. 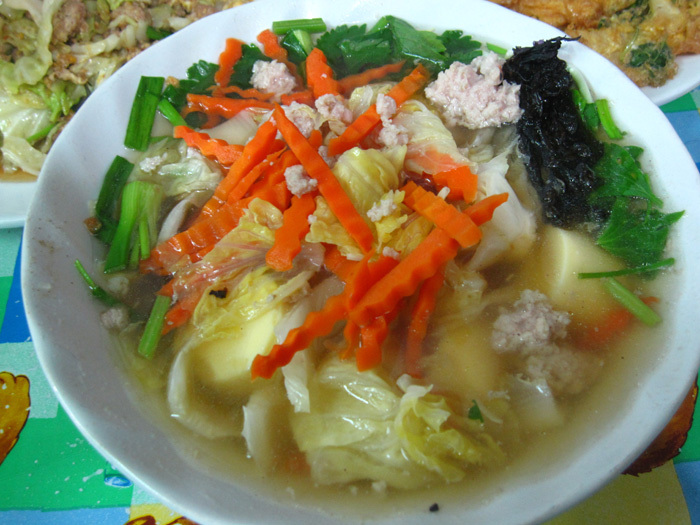 The soup is normally a meat stock, often either pork or chicken, and then in this particular dish, they often use a bit of minced pork, which is used in moderation, mostly for flavor. Probably one of my favorite choices for a healthy Thai food, and one of my top choices on this list, is something known as miang pla too (เมี่ยงปลาทู) or miang pla pao. Miang is the Thai word for a food that’s wrapped in vegetables, so sort of like a taco, but instead of a tortilla, a piece of lettuce or cabbage is used. It’s quite similar to the Korean style of eating barbecue. Anyway, miang pla too (เมี่ยงปลาทู) is the version made with mackerel fish, which is tasty and healthy, and miang pla pao, is the version usually served with a roasted tilapia fish, both served with a similar mixture of vegetables, herbs, rice noodles, and sauce. To eat miang pla too or miang pla pao, the simplest thing is to grab a piece of lettuce, load it up with a piece of fish, some rice noodles, add some sweet basil and mint, and then spoon on a bit of the sour chili sauce (sometimes peanut based as well), and enjoy. Miang pla is so delicious, and I love to eat it when I want something that’s fresh and light, and tastes extremely delicious. There are two variations to this healthy dish: suki nam (soup version), and suki haeng (dry version). 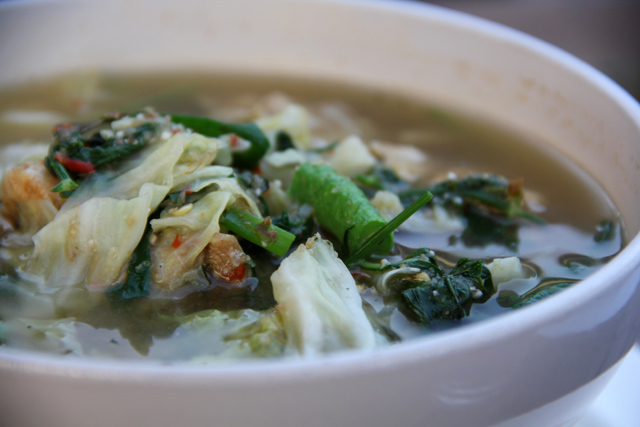 A selection of vegetables that usually includes cabbage and morning glory are cooked with a portion of clear mung bean noodles and a combination of seafood or whatever meat of your choice. The dish is served with a fantastic red chili sauce that truly makes it a flavor to cherish. Most Thais enjoy eating suki as a standalone dish, but I prefer to eat it along with a plate of rice. I’ve always been a big fan of any dish made with eggplant. In Bangkok the purple eggplant isn’t all that common, but they do have a similar long skinny eggplant that is green on the outside and tastes pretty good too. My favorite way to eat eggplant is stir fried in roasted chili sauce along with sweet basil and chillies, a dish known as makua yao prik pao. The eggplant soaks up all the delicious sauce making it one of my favorite vegetarian Thai dishes. 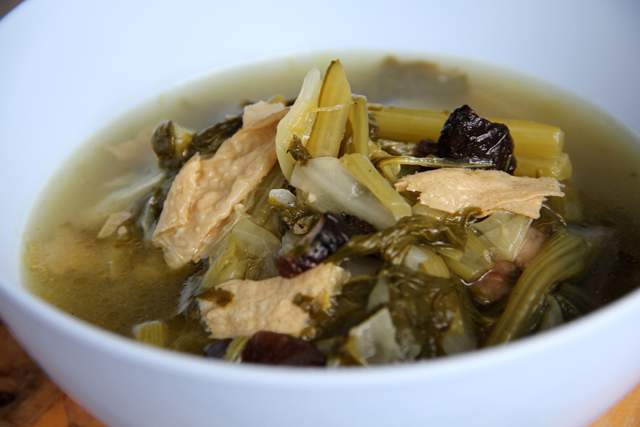 Gaeng Om is a type of healthy herbaceous northern Thai stew made from a selection of different vegetables along with either chicken or pork (or another meat of choice). Among the plethora of green leafy vegetables that go into the production of a delicious gaeng om, is a host of fragrant herbs. Dill is the protruding flavor that really gives it a kick! 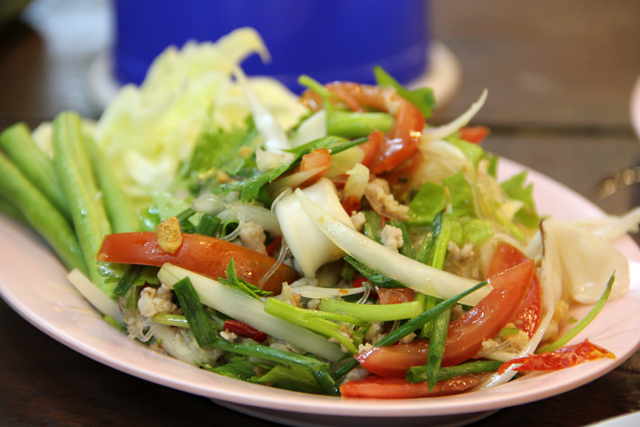 One of the classic dishes of southern Thai food is known as khao yam, in English basically rice mixed salad. Though it may look similar to khao kluk kaphi, khao yam is quite a bit healthier as it usually doesn’t include any pork. The dish is basically rice mixed with toasted coconut and topped with chopped green beans, bean sprouts, cucumber slices, and shredded kaffir lime leaves. It’s most often enjoyed with a sweet soy sauce on the side. 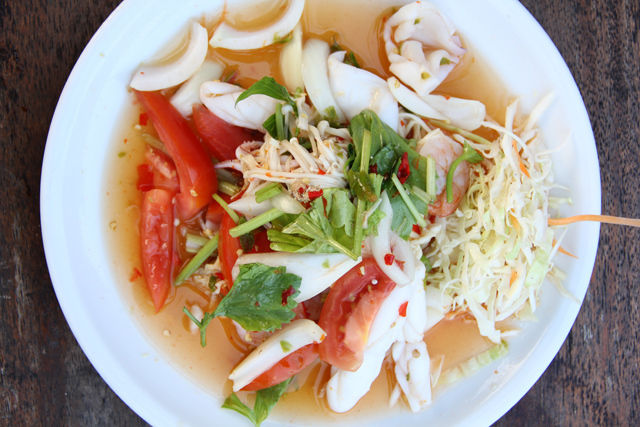 When it comes to healthy Thai food, yam talay (mixed seafood salad) can rally be a make or break dish. Break if the seafood is overcooked or the vegetables are over ripe but Make if the seafood is not overcooked and the vegetables are crisp and not overly ripe. 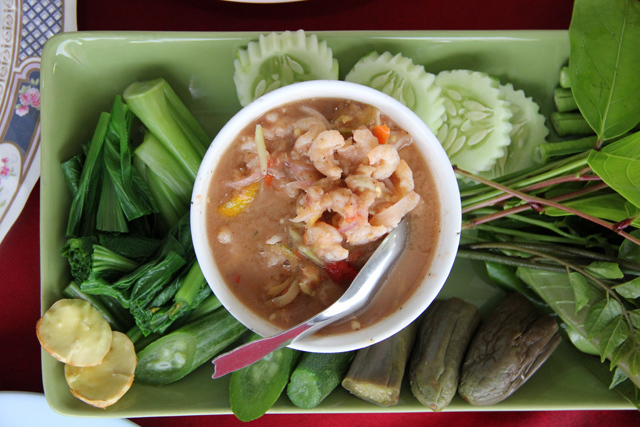 A selection of prawns, squid, and sometimes fish is boiled, mixed with freshly ripe tomatoes, mushrooms, and a few other garnishing vegetables and flavored with a Thai style sour and sweet dressing. The salad is fresh, quite healthy and overall it’s extremely tasty! 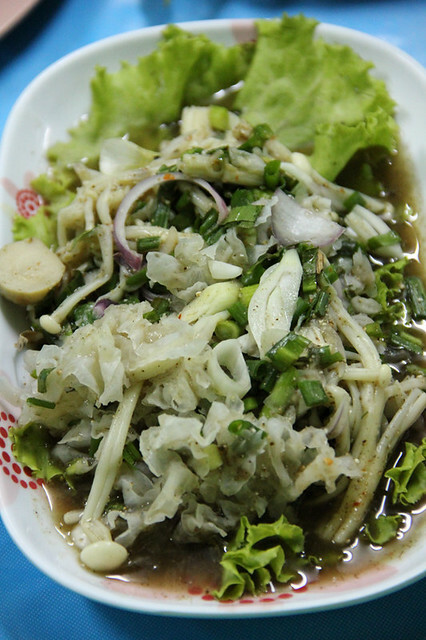 Another fresh dish in Thailand is clear mungbean noodle salad. It’s a very popular dish to eat in Thailand and though it contains bits of minced pork and some seafood (sometimes even hot dogs), the dish is full of great vegetables like tomatoes, onions, and celery. I like to order my yam woon sen extra sour, so it bursts with lime juice! You know the classic Thai / Laotian dish of larb moo (Isaan minced pork salad)? This is the same dressing and ingredients, but instead of pork, a variety of mushrooms are used in the recipe. This obviously makes the dish much more of a healthy Thai food! You can find this dish in the Vegetarian Thai Food Guide as a fantastic Isaan substitute dish. Available at mostly Chinese Thai restaurants, tom jab chai is a soupy stew that consists of mainly super soft boiled down veggies. Often flavored with chunks of pork, tom jab chai is not as healthy as it could be, but it still has lots of green healthy vegetables within it. The vegetables are cooked so long that they really melt in your mouth. 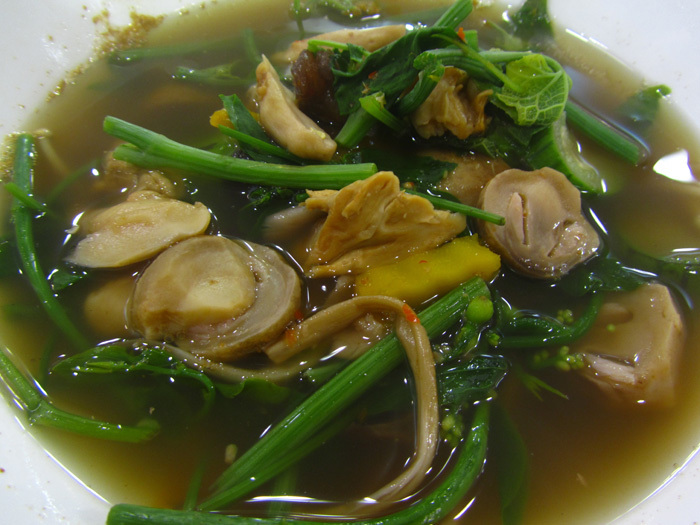 You can also get it as a vegan (Thai Jay) dish at Tien Sin Vegetarian restaurant in Bangrak. 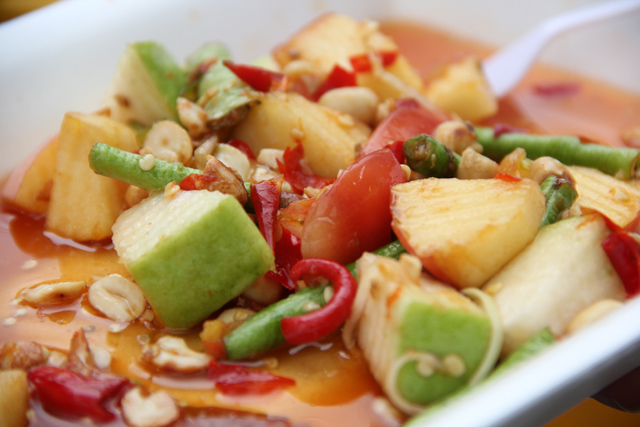 Nothing is better than a mixed fruit salad EXCEPT a mixed fruit salad covered in chillies, peanuts and a salty Thai dressing! At first it did sound a little strange, fruit and chillies? But after sampling my first plate of som tam ponlamai, I fell in love – in Thailand it just works! Try it! In order to eat healthy Thai food avoid the dishes that consist of heavy coconut creams (like lots of Thai curries), dishes where the main ingredient is pork or another red meat, and unfortunately the scrumptious Thai desserts. Also avoid all the deep fried snacks! To be a bit more health conscious try ordering stir fried dishes with just a little bit of oil (náam man nít nòi), or no oil at all (mâi sài náam man). Whatever you do though, don’t be afraid to hit the streets of Thailand to discover some more healthy Thai dishes! 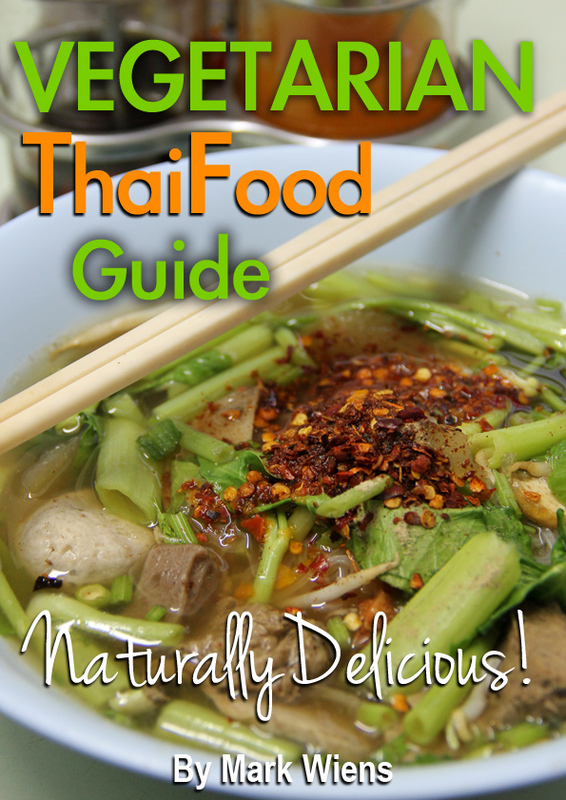 Lastly, I just wanted to announce that the Vegetarian Thai Food Guide is complete and now available! Not only is it extremely useful for vegetarian and vegans, but also if you want to start eating Thai food that’s healthy and extremely delicious! 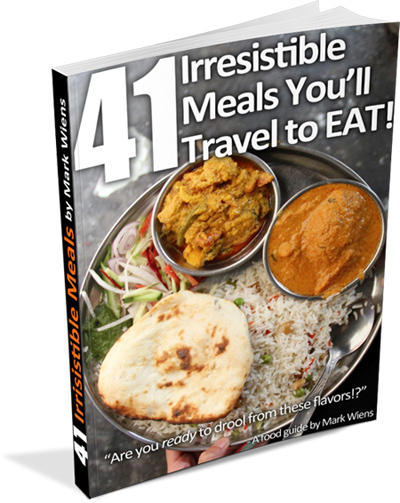 Click here to get more details about the Vegetarian Thai Food Guide! Many healthy Thai dishes you can eat without regretting a single morsel. – MSG isn’t scientifically proven that it harms the body while Thai people uses Fish sauce way too much and that cost overindulgent of sodium to the body. All Thai food is unhealthy, coz they put a lot of oil, sugar and msg in it. If you want to eat a healthy Thai food – cook it yourself. I liove in New Zealand and love Thai food but I usually have Pad thai, (mainly because of the price, but I do like it too). However I would like to try something healthy. Can you suggest something pleased that is found in New Zealand Thai restaurants. Hello Lai, you’ve probably been to Bangkok already and learned the terms for saltwater fish (pla taleh) and fresh water fish (pla nam jeud). 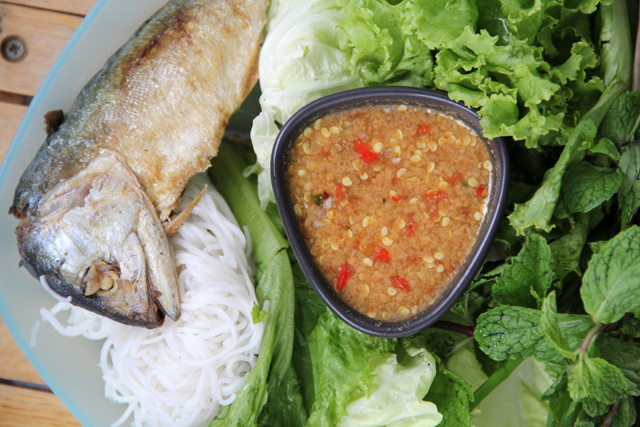 Which is your favourite fish in Thai Cuisine? This information was extremely helpful, thank you. Funny I didn’t see any of my favorites featured, bummer. Why is Pad Thai not good for me? Thank you very much Michelle, haha, Pad Thai is probably not the healthiest dish at restaurants, but I think you could make a pretty healthy version at home. My wife’s family loves eating Thai food and got me into it a couple years ago. I have heard that Thai food can be very healthy for you and so I wanted to find healthy Thai recipes. I think that I would really like that Pad Pak Gachet recipe! I am not experienced at making Thai food, so we’ll see what happens. Thanks for the ideas! I am Thai who live in U.S. For over 20 years now. I am 45 years of age. I love all these dishes that you like too. You really like tasty and spice food ha ha me too. I do miss Thailand because of variety of Thai food. Thank you very much Ek! This is a great post as it introduced me to several dishes I wasn’t aware of. They all look great in the photos so I want to try them on my next visit. I wonder if you might update the post with a shop that serves each of them. They wouldn’t even have to be your favorite places, just ones that serve decent representations of the dishes. Oh, and congratulations on the success of your Tom Yum t-shirt! Hey Jonathan, good to hear from you, thank you for checking out this article and for the suggestion. That’s a great idea I will try to update it and maybe add some better photos as well. Johannes makes a good point about Thai dishes not being necessarily “healthy,” but they enforce strict portion control due to their intensity. 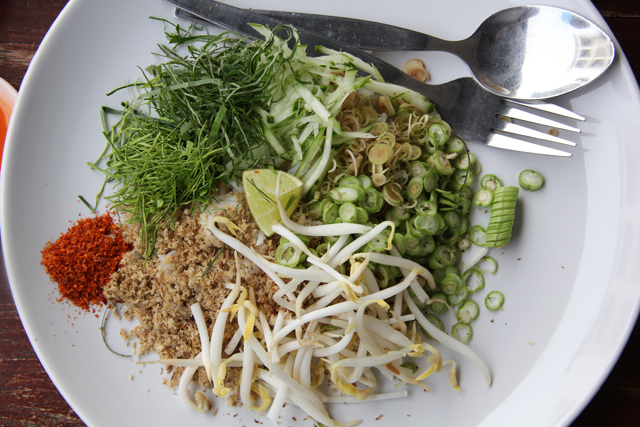 You’d have to be superhuman to eat more than one serving of Som tam. It’s spicy enough to burn the paint off of a car! Thanks for stopping by Johannes. That’s another great bonus about eating chillies! That’s interesting, good to know. Thank you so much. I have just started a 4 month South East Asia trip and feel like I have already gained 5kg in 3 days (Bangkok). This is an extremely helpful guide. I have just copied most of your suggestions in my notebook so I can remember them when i’m out and about. Awesome work! Hey Sharni, great, and hope you have a fun time eating! This is a very helpful article. 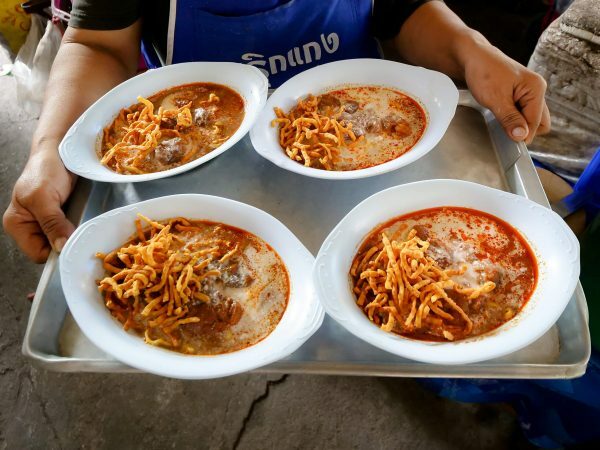 I’m in Chiang Mai long term and will be on the lookout for these dishes. Good to hear that John! You did a great job for my country. Thanks so much and your website is an awesome !! Thank you, glad you enjoyed this article!